As the adoption of quality methods grows across various industries, its implementation is challenged by situations where statistical tools are inadequate, yet the earlier a proactive quality system is introduced into a given process, the greater the payback these methods will yield. 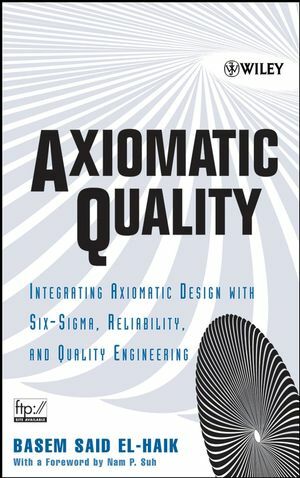 Axiomatic Quality brings together two well-established theories, axiomatic design and robust design, to eliminate or reduce both conceptual and operational weaknesses. Providing a complete framework for immediate implementation, this book guides design teams in producing systems that operate at high-quality levels for each of their design requirements. And it shows the way towards achieving the Six-Sigma target--six times the standard deviation contained between the target and each side of the specification limits--for each requirement. Acclaro DFSS Light, a Java-based software package that implements axiomatic design processes, is available for download from a Wiley ftp site. Acclaro DFSS Light is a software product of Axiomatic Design Solutions, Inc. Laying out a comprehensive approach while working through each aspect of its implementation, Axiomatic Quality is an essential resource for managers, engineers, and other professionals who want to successfully deploy the most advanced methodology to tackle system weaknesses and improve quality. BASEM SAID EL-HAIK, PhD, is Director of Textron Six-Sigma and Transformation at Textron Inc., where he is responsible for design of Six-Sigma and Six-Sigma deployment, including Black Belt waves, champions, and projects. He is a coauthor of Design for Six- Sigma: A Roadmap for Product Development. Dr. El-Haik also lectures and researches extensively on axiomatic design, robust design, Six-Sigma, and state-of-the-art quality methods. Chapter 2. Axiomatic Design Method. Chapter 3. The Independence Axiom. Chapter 4. The Information Axiom and Design Complexity. Chapter 5. Quality Engineering: An Axiomatic Perspective. Chapter 6. The Axiomatic Quality & Reliability Process. Chapter 7. Axiomatic Quality Process Concept Selection Process. Chapter 8. The Conceptual Design for Capability (CDFC) Phase. Chapter 9. Axiomatic Quality Optimization Phase. Chapter 10. The Low Pass Filter Axiomatic Quality Case Study. Chapter 11. The Axiomatic Reliability.